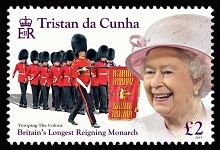 This set of stamps celebrates Her Majesty Queen Elizabeth II becoming the longest reigning Monarch in British history on 9th September 2015, surpassing the reign of her great-great-grandmother Queen Victoria. On 9th September 2015, Her Majesty Queen Elizabeth II becomes the longest reigning Monarch in British history, surpassing the reign of her great-great-grandmother Queen Victoria. 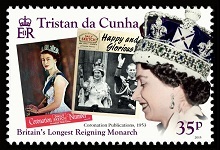 To celebrate this extraordinary milestone Tristan da Cunha is proud to release this special new issue as part of a series together with Ascension Island, Bahamas, British Antarctic Territory, Falkland Islands and South Georgia and the South Sandwich Islands. Queen Victoria came to the throne aged 18 and died in 1901 when she was 81, an incredible reign of 63 years and 216 days (23,226 days, 16 hours and 23 minutes) that defined an era and a people. In her journal Victoria recorded that "Today is the day I have reigned longer, by a day, than any English sovereign". The Victorians responded enthusiastically to her historic milestone yet, like our current Queen, Victoria did not encourage any celebrations ahead of the day. Yet for Queen Elizabeth II to become the longest reigning of the forty-one kings and queens of England since the Norman Conquest is without doubt an historic achievement. Like Victoria, Elizabeth II is much loved and during a lifetime of service has provided a reassuring and enduring source of stability in a fast and ever changing world. Elizabeth�s reign has seen more developments, achievements and records than any other. According to Guinness World Records she holds the world record for the most currencies featuring the same individual. 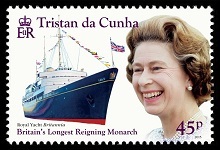 Her Diamond Jubilee river pageant in 2012 set a new world record for the number of boats in a parade. She was the first British monarch to have sent an email, to have a message placed on the moon, to have conducted a royal 'walkabout' and to have held a public concert in her back garden. 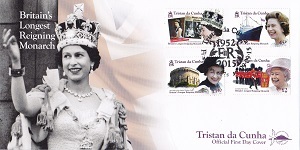 This series of postage stamps depict Her Majesty since her coronation with many familiar and iconic images from her reign. 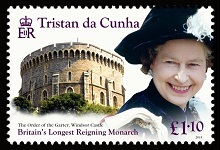 £1.10 - Each year in June a procession and service take place at Windsor Castle for the Order of the Garter. The Order is the senior and oldest British Order of Chivalry, founded by Edward III in 1348. If there are new Companions of the Order of the Garter, The Queen formally invests them with the insignia at a Chapter of the Order in the Throne Room of Windsor Castle. Afterwards The Queen and The Duke of Edinburgh entertain the members and officers of the Order at a lunch in the Waterloo Chamber. After lunch the Knights process on foot to a service in St. George's Chapel, wearing their blue velvet robes, known as mantels, and black velvet hats with white plumes. (Photo by Tim Graham/Getty Images). £2.00 - Trooping the Colour is a ceremony performed by regiments of the British and Commonwealth armies. It has been a tradition of British infantry regiments since the 17th century, although the roots go back much earlier. Since 1748 Trooping the Colour has also marked the official birthday of the British sovereign. It is held in London annually on a Saturday in June on Horse Guards Parade by St. James's Park. The Queen has attended Trooping the Colour in every year of her reign except when prevented by a rail strike in 1955. Formerly mounted herself, she commenced riding in a carriage in 1987. The portrait of Her Majesty was taken when she visited the Palace of Westminster to view the new Diamond Jubilee Window which has been installed in the Great Window of Westminster Hall on 6 December, 2013. (Photo by Arthur Edwards-WPA Pool/Getty Images).